You know what grows tiresome? Cooking. You know what never gets old? Going out instead! No matter your taste or style, Medina's got a place to eat that pleases every palate: home-cooked traditional, authentic Mexican, upscale splendor...and don't get us started trying to debate the best pizza joint in town, because even a solitary household can't agree whose sauce is better! Our solution? Eat out as often as possible, in as many different places as possible. From clothing boutiques to specialty shops, Medina's thriving business center is the lifeblood of the town. Our business owners do more than provide goods and services: they are an integral part of the community. We invite you to peruse and visit their place of business to see what we mean. We're proud to say Medina's business community are truly our neighbors and friends, just as likely to ask after your family as they are to sell you their wares. It's amazing how varied and unique you'll find Medina's shopping to be. Medina may be a small town, but that does not mean you'll have to travel elsewhere to find quality and exemplary services. We have a wealth of opportunities available to suit your various needs: From accountants and attorneys to doctors and dentists, Medina has just about everything, right down to a small town seamstress. Medina may be a small town, but that doesn't mean visitors have to drive an hour away to find quality lodging. Better, there's nothing ordinary or cookie cutter about the offerings Medina boasts. Once you see these architectural gems and enjoy the personalized care of your hosts, we're confident you'll want to extend your stay. Live in Medina? Close your eyes, spin around, and just a stone's throw away, odds are you'll hit upon a church! Medina is more than just a charming little community called home. It's a place with very strong, faith-based roots. If you're seeking a place to worship, Medina is more than happy to accommodate. Whether it's the local watering hole, the library, a dance studio, or the Senior Citizen Center, Medina's got something for everyone, no matter the age or inclination. There are so many social venues available to join and places to go, we're certain we've (accidentally!) left someone out. Want to see a social venue or activity promoted here? Contact us and let us know! We'll be happy to add your group's information, including a link to your page. Only requirement? It's gotta be Medina-based. That's what One Stop Medina's all about. One of the nicest things about a small town is the way people can get to know their neighbors and become close friends, simply by spending time together in shared activities and pursuits. Whether you're a history buff or someone devoted to service and charity work, Medina's got something for all. Best yet, Medina's community organizations all have welcoming, open-door policies. Each is happy to have newcomers join their ranks. And as for our local attractions, like the Canal Towpath, Medina Falls, and Swallow Hollow, well-there's a reason we put up with our long winters. Getting outside to experience Medina's countryside will tell you why. Medina offers outstanding educational facilities and curriculum. Our K-12 public institution, Medina Central School District, boasts just-right class sizes, a wealth of athletic pursuits, a multi-state-championship marching band, and multiple Advanced Placement courses and college credit classes, to name just a few accolades. For those seeking training and technical career accreditation, check out the Niagara Orleans BOCES facility. For those seeking higher education endeavors, Genesee Community College of Batavia has a branch campus right in Medina. For parents seeking a Christian education for their children, they'll find Orleans County Christian School. And finally, for those seeking infant care, nursery school guidance, or after school care for their youngsters, look no further than Medina's YMCA, P.Raising Kids, or Toddler's Inn Daycare, Inc.
One of our most important civic duties is our engagement and involvement in our own governance, from the national stage right down to the local political arena. One way to be an involved participant is to be aware and engaged by visiting the various government entities' websites, where you can find contact information for your elected officials, past and current agendas and minutes, and notifications of upcoming important events. The events calendar is what One Stop Medina's all about. The seed was planted at an Orleans Renaissance meeting in the summer of 2013. Frustrated while trying to figure out the best date for an upcoming concert, a member bemoaned, "I wish there was one place we could go to find everything! A community calendar of some kind...then maybe we wouldn't double book when something else was going on!" From that small kernel, One Stop Medina was born. Practically everyone we know is involved and active across a very wide spectrum, from their businesses, to their social groups, to their churches, to their kids' activities. Imagine a storekeeper who belongs to a church and a book club, whose children are involved in Scouts and Marching Band. Where to go to post all the upcoming events, especially the ones she wants others to attend, like a fundraiser carwash, an open-to-all church picnic, and an upcoming Thursday night sale? Now there's one place to go. 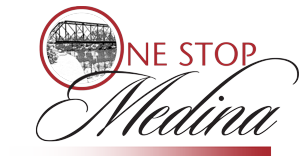 One Stop Medina's Events Calendar. And here's the very best part: Anyone can enter any event, for FREE, and there you go: One stop. All of us know.